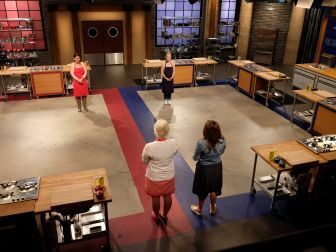 Tonight at 9pm ET/PT on Food Network is the finale of Worst Cooks in America: Celebrity Edition where the winner will take home $50,000 for their charity. The final two contestants are Jenni "JWoww" Farley representing Anne Burrell's team and Kendra Wilkinson representing Rachael Ray's team. On this episode, JWoww and Kendra are coached by their mentors and have to cook a three-course menu for a panel of experts. Whoever cooks the better meal will win $50,000 for their charity. To get to this point, the order of celebrities eliminated was Dean Cain (episode 1), Jaleel White (episode 2), Chris Soules (episode 3), Barry Williams(episode 4), and Ellen Cleghorne (episode 5). The ratings for Worst Cooks in America: Celebrity Edition have been very good for a Food Network show on a Wednesday night bringing in about 1.5 million viewers per episode, so this may be something Food Network will try to do again. I will update this post with the winner of Worst Cooks in America: Celebrity Edition once the episode airs. After the three course meal, the judges decided that Jenni aka JWoww and Anne Burrell were the winners of Worst Cooks in America: Celebrity Edition. JWoww won $50,000 for her charity Pick Your Paw Rescue and Kendra received $5,000 for her charity.